Brian: Thank you for taking the time to answer my questions. First off, Gemini Wars looks like a fantastic real-time strategy game set in space. While it has some traditional elements of a RTS game, such as base building and resource gathering, how would you say Gemini Wars differs from other games in the same genre? Bruno: The gameplay of Gemini Wars mixes a few gameplay innovations with traditional elements, so players won’t really feel lost playing the game. The movement of the units is somehow unique: to jump between planets or asteroids, the ships must perform hyperspace jumps; when they reach their destination, the hyperdrive engine must be recharged. Adding to this, there’s also the hyperspace range, which means that a ship may not simply be able to jump from point A to B. This system creates strategic scenarios where some routes become really important to achieve victory. The resource gathering is done by building mining stations in asteroid fields, which means that these points are highly strategic too – the player is encouraged to expand to earn resources so he can build a large fleet. Adding to the gameplay elements, there’s also the story of the game. We feel that many strategy games have dropped the story and characters of the single player experience, which is a shame, because that really enriches the experience and immersion of the game. Gemini Wars has an interesting story and cool characters that we hope will help bring this universe to life. Brian: Gemini Wars looks like it has a fairly detailed backstory with three factions. Can you describe the three factions in some detail, and tell us how they differ from one another? Bruno: There are two human factions (United Space Federation and the Alliance of Free Worlds) and one alien faction (Gark). The USF is a hard and militaristic faction centralized on Earth and its oldest colonies, and is backed up by a vast fleet and ground armies. The Alliance of Free Worlds is composed by a number of independent systems and planets each with its own government that combine their military resources to oppose the USF. These two factions have been at war for decades, since the declaration of independence of the Alliance’s systems from Earth’s control. The Gark are an unknown alien species that have recently appeared in the Alliance space. Their motives are unclear. Brian: Besides the story mode, which looks like it focuses on one faction, could you give us more details as to the skirmish and military modes, please? Bruno: The game at release will feature the single player campaign. We are already working on the skirmish and multiplayer mode to be released later as free DLC. In skirmish mode the player can choose any of the 3 factions, and fight in a pre-selected map (which can have only one or several star systems). Multiplayer is basically skirmish mode but against other human players. Brian: Maps apparently can be one solar system or several connected by jumpoints, and within these maps, you have to manage ships, bases and planets. With all that to juggle, you have to have an interface that can help the player handle it all efficiently. Could you therefore please give us more detail about how the interface in Gemini Wars works to juggle all of these elements successfully? Bruno: The action can be quickly and easily zoomed in or out from a ship to the system view, and the player is constantly receiving feeds and information from battles or constructions, so it’s very easy to keep track of what’s going on everywhere. 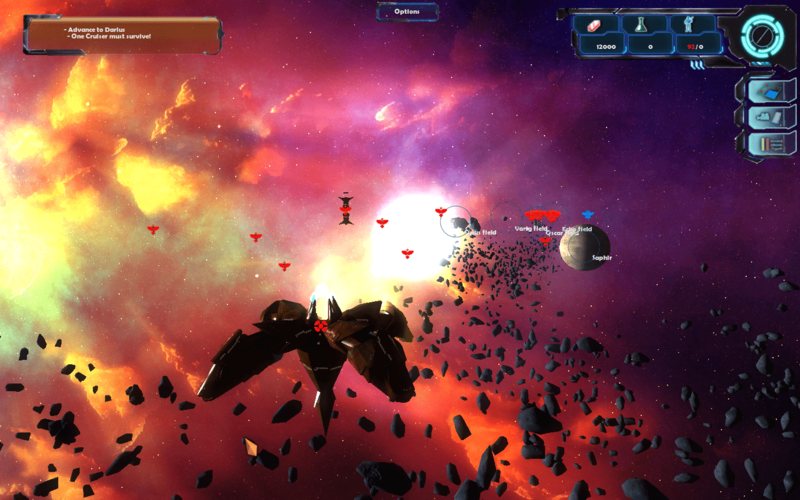 The player can also create groups with ships, which makes it easier to manage the whole fleet. Brian: Besides the control of space, it looks like planetary control is fairly detailed as well. Could you give us more information on how detailed the ground game is? Bruno: Planets provide the crew for colony and troop ships, unit cap and also support the construction of 5 Battleships. This means that if the player wants to build a lot of Battleships (really powerful ships), he will need to control several colonies. A planetary colony can be upgraded with shields and weapons that can fend off attacks from space. Besides that, the colony has its own planetary garrison that will fight on the ground against invaders. To capture a colony, the shields and weapon systems must first be destroyed. Only then can the troop ships that carry the marines be sent to the ground. Once the ground battle starts, the player will get a real time report of the battle accompanied by a video feed. The player has no control over the battle though. Brian: Now tell us more about the real stars of the show here, the ships. What kind of ships will be available to the player, and will we be able to craft our own? Bruno: The human ships range from small frigates to Battleships and Carriers. The Gark have some additional “special” units. Ships can’t be crafted, but they can be upgraded by researching new technologies. Brian: How do the ships relate to each other? Will it be more of a rock-paper-scissors thing, or will there be similar designs on all three sides with minor variations (i.e. the frigate, the cruiser, the battleship, etc…)? Bruno: The ships share similar designs but with variations. Adding to that, the Battleships can be customized with special weapons / abilities. These range from powerful shields, anti-missile batteries, shield drainers, EMPs, etc and vary from faction to faction. Brian: Your game has boarding actions, which is something I wish more games of this type had, honestly. Could you give us more detail as to how boarding works, and what options you have with a ship once captured? Bruno: The larger ships in the game can be targeted in subsystems (weapon systems, engines, shields, etc). To board an enemy ship, its weapons should first be disabled; it’s not mandatory, but the assault shuttles might be shot and destroyed if the weapons are still online. After this is done, a Battlecruiser can send assault shuttles carrying marines to attack the enemy ship. The boarding action is similar to the ground battle: the player gets the information accompanied by a video feed until the battle is over. If the battle is won, the player will gain control over the ship. Since the ship will probably be damaged, it’s recommended to retreat to an allied military station to repair it. Brian: Can you tell us in some detail about the engine you’re using, such as how much detail is present on each ship and station, how many ships it can handle at one time and so on? Bruno: We’re using the Unity Professional engine. Unity allows high visual details, and we came up with a LOD (level of detail) system that allows zooming into a ship and seeing all the texture details, normal mapping, specular, and when we zoom out we simply disable features on that ship and as such minimize the impact on the renderer. Effects that we turn on or turn off depending on the distance range from engine trails, flares, lasers, ship fire damage, hyperspace effects, explosions, shield impacts, debris when exploding, quite a lot of stuff is packed into the LOD system. About the number of units at one time – we didn’t reach a limit number, but in all playthroughs and tests we ran, we didn’t have any problems. Brian: While there are skirmish modes and multiplayer, how else will the game’s life get extended beyond the campaign? Will there be a map editor, random map generator or modding support, for example? Bruno: A random map generator is something that we would like to do, but no promises yet. We do plan to release additional maps for free of course. We’re also discussing the possibility of making another campaign with one of the other factions. Brian: Speaking of, could you give us more details about the game types available in skirmish and multiplayer? Will it be a more traditional 4X type of thing, or will there be other types of game modes available? Bruno: For now we’re only thinking in classical deathmatch / annihilate opponents. But we can easily create other game types like capturing locations, king of the hill, etc.